, an integrated loop switcher, IR loader, kill dry function, 0 to 20dB volume boost and an accurate tuner into a simple-to-use floor unit. 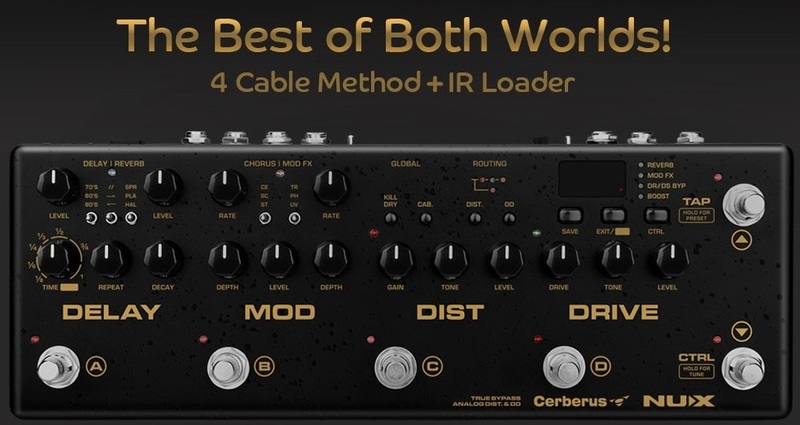 Great tone, ultimate flexibility, easy control and extreme portability make Cerberus ideal for all players. Cerberus will be available from official dealers, and the street price will be $299 (USD). NUX Cerberus is our flagship integrated Effects / Controller Multi-Effect that transports you to a whole new world of legendary tones. It's versatile, easy to use, and combines an unusual array of multiple guitar effects without loosing the basic effects in a straightforward stompbox. And the more you gig with it, the more you‘ll appreciate our carefully thought-out, user-friendly interface. You get 16 types of effects integrated into NUX Cerberus's 4 effect modules : DELAY, MOD, DIST and DRIVE. And check this out ! 1. Both DIST and DRIVE Modules are analogue circuits, making them sound as natural as a tube amplifier. 2. Furthermore, DELAY, DIST and DRIVE modules, offer a variety of Signal Paths / Routings carefully selected to satisfy the most discerning user. 3. Real-Time Tweak-Control. Need to make adjustments on the fly? No problem, Cerberes lets you--just like a regular stomp box. 4. UP to 128 presets can be saved into NUX Cerberus’s 32 banks; 4 presets are organized to be 1 bank.FOOTSWITCHS: A/B/C/D recall any of the 4 presets within a bank. Use the TAP○▲ and CTRL ○▼ to switch banks. 5. Realistic Cab Simulation, with IR loader with 3rd party IR files supported. This might just give Valeton a run for their money. Kudos to NUX for upping the game in the world of guitar effects strips. I saw this a while back, and I love how they have separate outputs for front end and for the effects loop. Maybe around $299 based sa guitar-world article. Baka less sa atin cuz less shipment fee from China hehe. watched a demo of this baby this morning. very very promising. lotsa useable tones. and that IR loader is just a super sweet deal! Onhand NUX effects and musedo tuners !!! Pang mixer lang or headphone out yung CAB sim ng cerberus? Has anybody tried hooking it up sa FRFR? Or sa powered speaker?